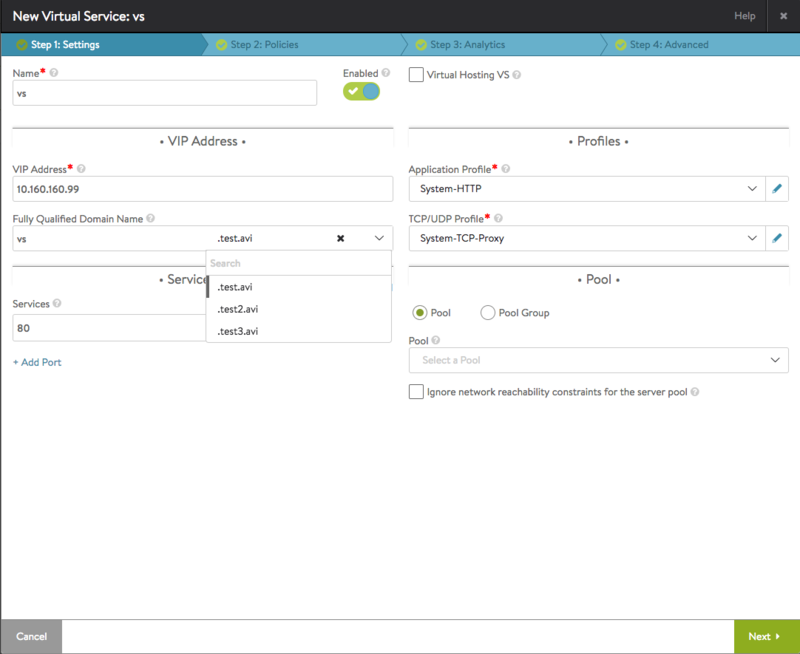 When creating virtual services in OpenStack or AWS cloud, a separate configuration for IPAM is not needed/allowed, since the cloud configuration has support for IPAM natively in Avi Vantage. 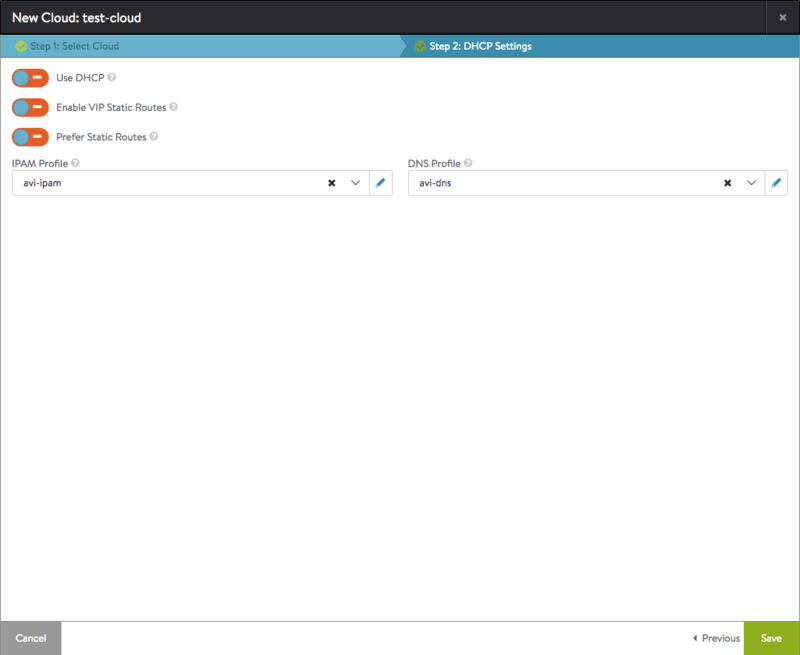 Avi Vantage supports Route 53 when AWS is the cloud provider configuration in Avi. Avi Vantage DNS service can be used with all these clouds. Initial configuration is common to both IPAM and DNS. This section lists the steps for configuring IPAM and DNS support. The configuration fields differ among the infrastructure types and the provider (Avi Vantage, Infoblox, AWS, GCP, and OpenStack). See the sections following this one for detailed steps. Navigate to Templates > Profiles. Click Save. The profile appears in the list. Navigate to Infrastructure > Clouds, and edit the cloud setting. Select the IPAM and DNS providers from the pull-down list. Either one or both need to be selected, based on the provider selected. For example: if Infoblox is the IPAM provider, it must be the DNS provider as well. (Optional) For east-west virtual services in this cloud, you need to additionally select east-west IPAM and DNS providers from the pull-down list. Either one or both can be selected. The following examples are cloud-independent. IPAM only. 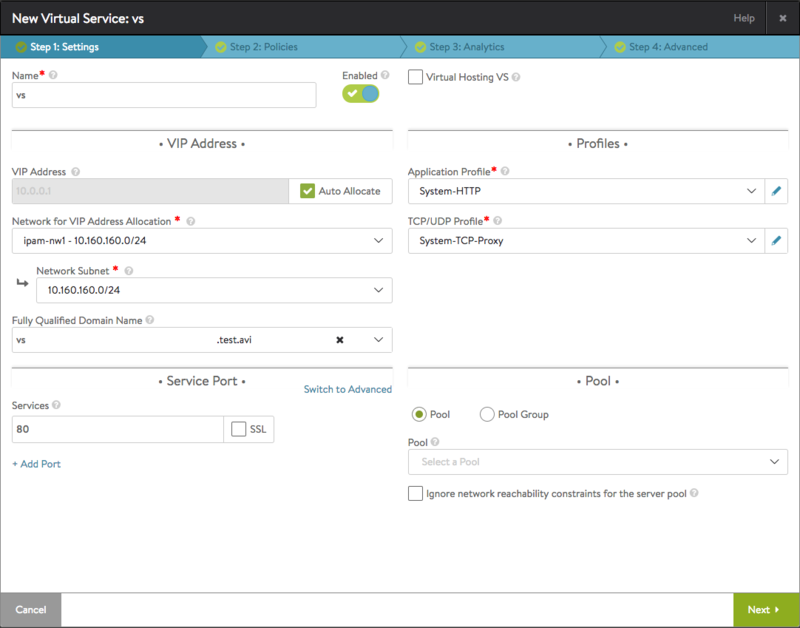 With IPAM in play, selecting the Auto Allocate checkbox causes the Network for VIP Address Allocation selection box to appear. From a list of displayed networks and subnets a choice can be made; in this case, either ipam-nw1 or ipam-nw2 can be selected. 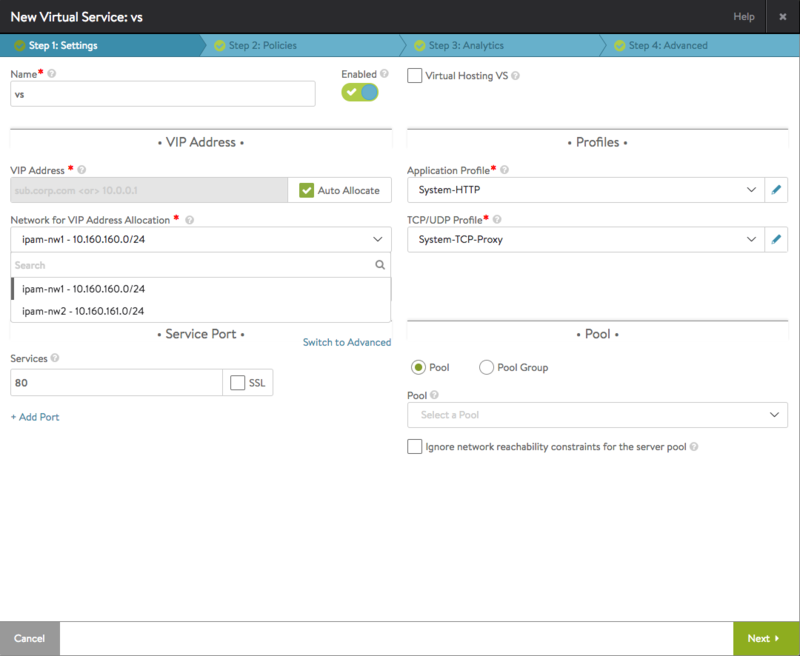 From the selected network (ipam-nw1) an address for the VIP will be auto-allocated. IPAM is the only option for this virtual service. DNS only. With DNS in play, no list of networks is offered. Instead, one of several domains is offered. By selecting .test.avi from the list and accepting the default prefix (vs) in the Fully Qualified Domain Name field, the user is specifying vs.test.avi as the final FQDN. DNS is the only option for this virtual service. IPAM and DNS. With both IPAM and DNS available, the user can both specify a network from which to auto-allocate a VIP address and the FQDN (vs.test.avi) to which it will be associated. Both IPAM and DNS are options for this virtual service. If a DNS profile is configured under a cloud where the virtual service is being created, then the virtual service's IP cannot be determined from a fully qualified domain name; the user is expected to enter an IP address or select the Auto Allocate checkbox. In the case of Infoblox, if there is a list of usable_subnets/usable_domains configured (refer to section for Infoblox above in this article), then the dropdown will consist only of those entries. If no such configuration is found, Avi Vantage will display the entire list of available subnets/domains from Infoblox.